The Arboretum is prepared for snow! For visitors, that means a season of skiing, snowshoeing, and winter hiking. 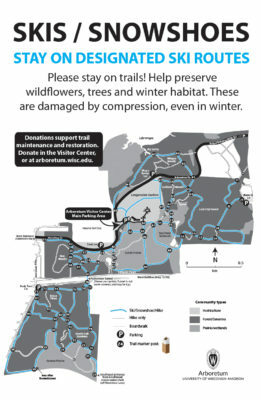 Winter hiking is permitted on all 17 miles of Arboretum trails unless otherwise posted in the field. We have designated more than 10 miles of ski and snowshoe trails. The official ski and snowshoe map is posted in the Visitor Center and at trailheads. (Download ski map PDF) The Visitor Guide trail map also shows ski/snowshoe routes. For your safety and to protect restorations, use only designated and marked trails. The ski/snowshoe trial map is posted at trailheads and in the Visitor Center. Click image for larger view. Below are some frequently asked questions about our winter trails policy. Enjoy winter at the Arboretum—and thank you for your cooperation! Where Can I Ski or Snowshoe? Please use only designated ski/snowshoe routes. Routes are marked in the field and on the winter trail use map. In Longenecker Horticultural Gardens, ski and snowshoe trails are marked with blue-tipped stakes. Throughout the rest of the Arboretum, most ski routes are on service lanes, with some connecting trail segments. Some trails are for hiking only and are not open to skis and snowshoes (these paths have international hiker signs or “No skis or snowshoes” signs at the trailhead). Ski trails are multi-use and are not groomed. Where possible, please avoid snowshoeing and hiking in ski tracks. Always stay on trails: going off trail compacts snow and ice, damaging plants—even in winter—and disrupting subnivian (beneath the snow) habitat for overwintering animals. As always, hiking is permitted only on designated trails. 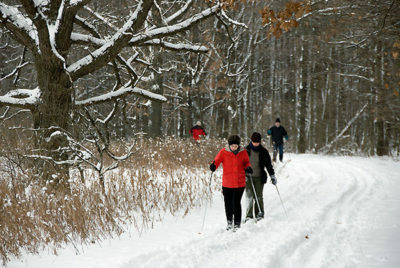 Hikers may use ski trails. Where possible, please avoid hiking in ski tracks. Hikers may also use footpaths that are marked with “hike only” red stakes or international hiker signs at the trailhead. 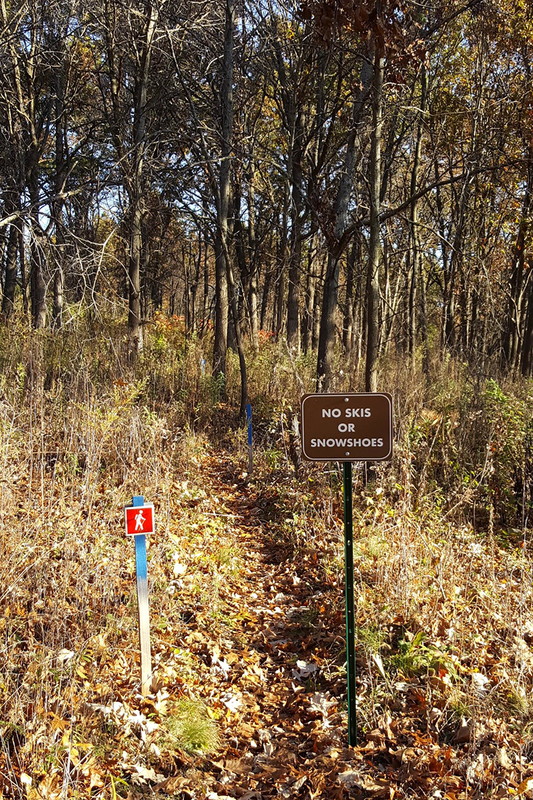 Skiers and snowshoers should not use “hike only” trails. All users should stay on trails at all times to protect Arboretum land, as plants and animal habitat can be damaged under the snow. Why Are Some Trails Closed? Trails may be closed due to hazards or frequently changing conditions. For example, a trail section may have a fallen tree, storm water flooding, or sharply broken ice patches. Trails through sensitive restorations or newly seeded areas will also be marked off limits to skiing, snowshoeing, and hiking.